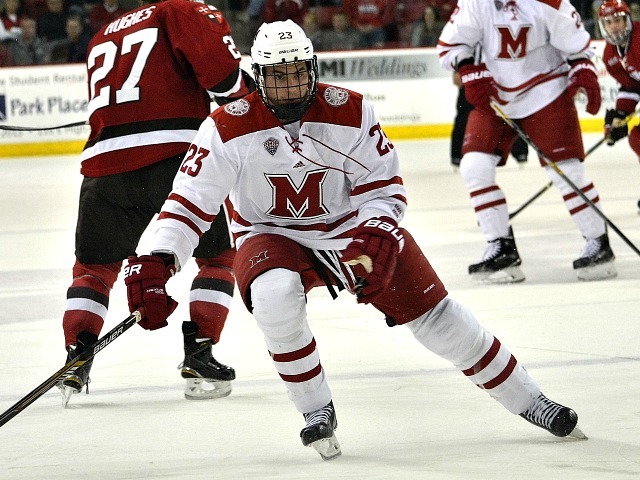 OXFORD, Ohio – Miami has built a reputation for being one of the toughest teams to score on in college hockey. Providence appears to be the RedHawks’ defensive kryponite. The Friars beat Miami, 7-3 at Cady Arena on Friday, giving them 14 goals in two games vs. Miami, which likely can’t wait to play anyone else after losing to PC in the first round of the NCAA Tournament to end its 2014-15 season. With the lopsided score, it’s easy to say the defense and goaltending let the RedHawks down, and oh by the way, that’s supposed to be the team’s strength heading into this season, and while that isn’t completely untrue, as much credit belongs to Providence in this game. The Friars were seemingly able to pick the corner of the net at will, and when they had opportunities, they did not miss. Maybe it’s just because of the optimism of opening night, but this game seemed more like a team that is better right now played a nearly perfect game than Miami laid an egg on home ice to start 2015-16. The first and third goals the Friars scored were perfect shots in the corner of the net. The second was on a penalty shot that was awarded even though it didn’t look like PC’s skater had a clear step breakaway. The RedHawks got back to within one, but Providence put up four more in a row, as Miami sometimes has a tendency of not being able to stop the bleeding in games like this. Overall this still looks like a good MU team. One loss doesn’t change that, even though it was lopsided, and of course it’s magnified because it was the season opener. – OK, one negative that needs to make it into prose is that Captain Kuraly didn’t play particularly well in this game. Sean looked like he may have been banged up or fighting an illness, as he appeared out of breath at times and hunched over. Defenses will pay much more attention to him this season with Czarnik-Barber-Coleman gone, and the 19-goal scorer from 2014-15 will need to step up if he hopes to match that goal total this season. – Obviously Jack Roslovic, a first-round draft pick, was studly. He scored the first goal of the season, whipping it jai alai style into the net off a power play centering feed. Clearly Roslovic is going to be an offensive beast this season. – There’s a ton to like about Josh Melnick, who may have been better than Roslovic in this game. Melnick set up the Roslovic goal, scored one of his own and made a couple of great plays on the penalty kill. It speaks volumes about how much confidence Coach Enrico Blasi has in him that he’s on the first power play and first PK unit. From a purely Miami hockey fan perspective, Melnick not being drafted means he will likely spend four years in Oxford, and that will be fun. – None of the other freshmen forwards stood out, bad or good. That’s OK. It was their first game. The chemistry will come. None looked lost on the ice. Roslovic and Melnick will obviously make up some of the void left by the departing forwards, and in theory the veteran defense and goaltending should make these players’ transitions easier, as the coaches can concentrate on helping develop them, and the team shouldn’t need to score as much to win. Friday didn’t exactly advance that theory, though. It a tough way to start the season, but it was only one game. Time to move on. Some good things happened Friday, and it will get better. FORWARDS: B. It was a pretty good night for this group. Melnick was awesome, Roslovic is going to be excellent, and senior Alex Gacek and junior Devin Loe also played really well. The latter two are what Miami needs: Veteran players who weren’t studs to step up. Gacek played his best hockey the second half of last year, and Loe has looked very good at times when given the opportunity, and with a short stash of reserves, he should have a chance to earn plenty of ice time this season. DEFENSE: C-. As usual, this is the hardest area to grade, and with the lamp getting lit seven times, it makes it tougher to grade higher. Freshman Grant Hutton did some really good things and looks like he has a lot of potential, but he also let a player cut in for the breakaway on which he was called for the penalty shot that resulted in the second PC goal. He allowed another player to cut in for an odd-man chance later in the game. But he looks big, strong, smart and agile for his size, and he should turn into a solid defenseman. Colin Sullivan’s goal was a thing of beauty, which gets the grade above the ‘D’ range. GOALTENDING: D. Like we said, Goals 1 and 3 for PC were just wired. The second goal was a penalty shot, and except for a big rebounds, Providence had very good looks on the rest and did not miss. Not a fan of ever allowed a goalie to give up seven, whether it’s his fault or not, so it would’ve been nice to see him lifted earlier to his confidence doesn’t take a bigger hit. Ryan McKay stopped one shot in relief and will almost certainly start the series finale. LINEUP: The odd men out for this game were forwards Andrew Schmit and Justin Greenberg, and defenseman Chris Joyaux. Greenberg is banged up, and we’ll see how the defense is handled moving forward. Joyaux played well at the end of 2014-15, so we’ll see how much patience Blasi is going to have with Hutton. Knowing Blasi, he’ll probably rotate which blueliner sits, with Louie Belpedio, Matthew Caito and Taylor Richart likely being the three with job security at this point. A year ago at this time, Miami had 28 players on its roster, the most in recent history. Entering the 2015-16 season, that number is just 24. Due to factors beyond the program’s control, the RedHawks will be without four players from last season’s NCHC Frozen Faceoff championship team, plus another transfer Miami was expecting on its team this fall departed for the pros. Six more graduated. Seven new players are coming in for a net of minus-4. Defensemen Trevor Hamilton and Matt Joyaux left the team mid-season in search of more playing time. Forward John Doherty also departed. Forward Jimmy Mullin has a year of eligibility left but surprised everyone by transferring to Minnesota State. Forward Ryan Lomberg had eligibility issues resulting from his transfer from Maine, so last month he chose to turn professional. With a 24-man roster, that gives the RedHawks just three extra skaters heading into this season. Let’s take a look at Miami, the 2015-16 edition, by position. Out: Riley Barber (turned pro), Austin Czarnik (departed senior), Blake Coleman (departed senior), Alex Wideman (departed senior), Cody Murphy (departed senior), John Doherty (left team), Jimmy Mullin (redshirted in 2014-15 and transferred). In: Jack Roslovic, Ryan Siroky, Zach LaValle, Josh Melnick, Kiefer Sherwood. So seven of 12 starters return from last season. Assuming all are back in the lineup each night, that leaves five openings. 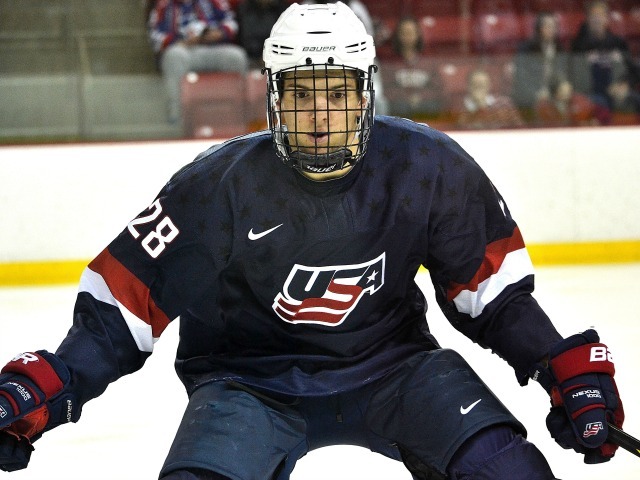 Spoiler alert: Jack Roslovic, Winnipeg’s first-round pick this summer, will be one of them. And although Devin Loe has dressed just 16 times in two seasons, he has played very well at times and certainly has a shot at regular ice time, which should be available after all of the team’s key losses. Miami’s Devin Loe (Cathy Lachmann). That means Loe, Siroky, LaValle, Melnick, Sherwood and possibly Mooney will be competing for four spots. In other words, the incoming freshmen have a chance to play a lot. Obviously Miami lost a ton of talent up front, but the RedHawks still have a solid corps of returning forwards, and the resumes of the newbies are impressive. It may be a situation in which this group improves as the season progresses as it builds chemistry. Out: Ben Paulides (departed senior), Trevor Hamilton (transferred), Matt Joyaux (transferred). Last fall it appeared Miami would have plenty of blueliner depth through this season, but with Hamilton and Matt Joyaux departing, that leaves the RedHawks thin on reserves if they suffer injuries. The relative shortage here is part of the reality of having a top-10 college hockey program, year in and year out. All of the players that come to Oxford are good these days, and more than ever don’t want to sit for one or two years during crucial development seasons to wait their turn. Even with only one extra plus swingman Mooney, determining who will dress will be a tough call for coach Enrico Blasi each night. The five returning starters are all going to play, and Sullivan was very good before getting hurt early in the season and played sparingly when he returned mid-season. The wild card of course is Hutton, a 6-feet-3 freshman who has split the last three seasons between the USHL and NAHL. It was Jeff and Eff, then Cody and Connor and now the Jay and McKay show enters its fourth season. The same could’ve been said in any of the past 10 years, but at least at the start of the season, we’ll probably see McKay and Williams in some sort of rotation, although Williams ultimately logged the majority of minutes in 2014-15. No problem with depth here, as Miami will have the luxury of two fourth-year regulars in net. McCarthy is a different kind of third goalie, as coach Nick Petraglia indicated that he will have plenty of opportunity to compete for playing time, especially after this season. Just from a roster make-up perspective, it would be beneficial for the RedHawks to stop their eight-year trend of having their two top netminders in the same class. Blasi loves guys that can play both forward and defense, and on a 24-man team, Mooney becomes invaluable. With limited extra skaters, it’s imperative that Miami avoids injuries and on-ice shenanigans, which is easier said than done playing in a smash-mouth conference like the NCHC. This team can also ill-afford the parade of transfers it suffered through last season, although with 18 starting slots for 21 skaters, almost everyone should see plenty of ice time.